The development of this area of Kensington took place largely after the Great Exhibition of 1851 when Parliament decided to establish a 'cultural centre' and grand residential estate. The land was owned by the 1851 Commissioners and a number of private estates, including the Harrington estate, where building began in 1855 on the site of former market gardens. The gardens were laid out c.1860 for the use of those living in surrounding houses, this privilege extended to those in the near neighbourhood. In WWII there were air raid shelters under the gardens. Since early 1990s the residents have been restoring the gardens, and paths have been re-drawn and gravelled to the original layout. In the interim additional planting had taken place, including a grove of 12 silver birch trees for the Queen's Silver Jubilee in 1977. Development of this area of Kensington took place predominantly after the success of the Great Exhibition of 1851 when Parliament decided that a 'cultural centre' for the Nation should be established here, together with a grand residential estate, and identified funds from profits of the Exhibition and additional monies from the Treasury. Ownership of the land was in the hands of the 1851 Commissioners and a number of private estates including the Harrington and Alexander estates. Up until then a number of individual houses, some substantial, had been built in the area. Building began in 1855 on the Harrington Estate, developed by William Jackson with C J Richardson the architect, and the first terrace of houses is now 5-19 Queen's Gate. The style of Jackson's development, which extended north to 1-4 Hyde Park Gate and was also on land owned by the 1851 Commissioners, was suitably opulent, maintaining the tradition of the Georgian town house with mews behind, grand terraces of four or more stories with ornamental stuccoed facades above a rusticated ground floor. An agreement dated 1855 records the purchase of mostly market garden land in the area by the Royal Commissioners for the Great Exhibition and the gardens were laid out c.1860 when the large Victorian houses were built. In 1928 the Report of the Royal Commission on London Squares gives the owner as Lady George Campbell and use restricted to lessees or inhabitants of those living in surrounding houses on payment of a garden rent, this privilege extended to inhabitants of houses in the near neighbourhood; the leases expired in 2004. The maintenance was then as now by a Garden Committee. At the time it was described as 'Surrounded by a thick shrubbery. Attractively laid out with lawns and flower beds, and contains some well-grown trees'. The layout is little changed apart from railings on the west side and around the beds in the middle. 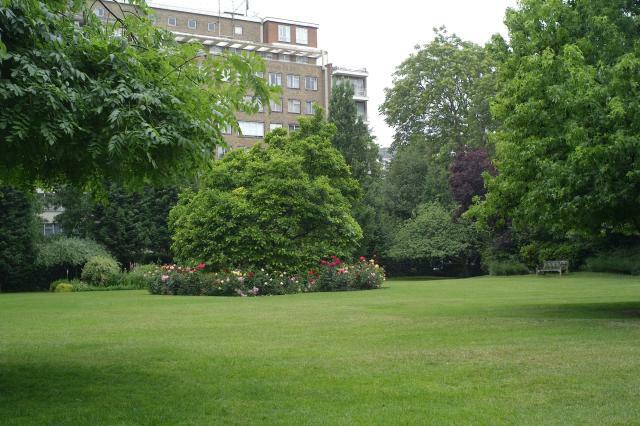 The side beds are unusually high, apparently filled in during World War II when bomb damage was cleared; air raid shelters had been built under the gardens and circles are still visible in the lawn marking where they were. Since the early 1990s the residents of Queen's Square have been restoring the gardens and the paths have been re-drawn and gravelled to the original layout. In the interim period additional planting had taken place, including the planting of a grove of 12 silver birch trees for the Queen's Silver Jubilee in 1977. In 2000, MP for Kensington Michael Portillo planted an English oak in the garden. A campaign prevented a car park being built on part of the site. Trees include a catalpa apparently dating from the original layout as well as a mulberry tree.